Soft, absorbent and ultra slim - our new essential Waitrose nappies have been designed and developed to keep your baby dry and comfortable throughout the day and night. With a super absorbent core to lock away any wetness, and stretchy sides for a snug and secure fit, the essential Waitrose nappy gives your baby maximum protection and the flexibility to move with ease. Made with extra delicate materials for baby sensitive skin, our nappies also have less bulk between the legs and our specially designed leg cuffs help to prevent leaks. Our nappies range from size 1 newborn all the way up to size 6 extra large and includes plus sizes when babies need extra protection, which are perfect for night time use. 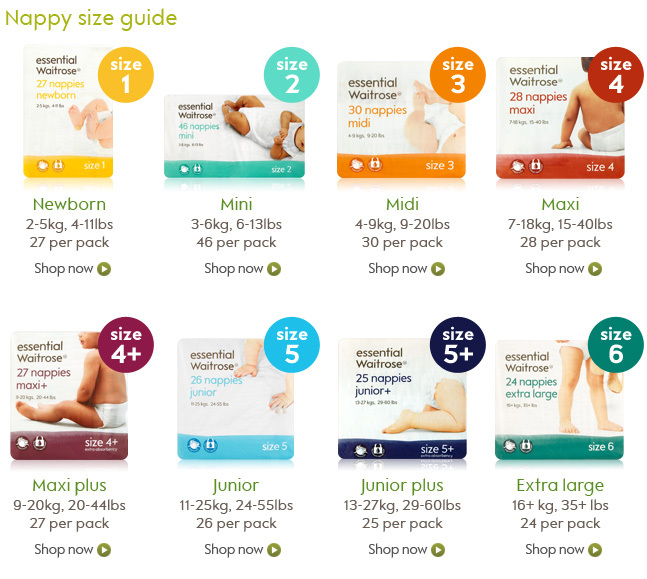 Our essential Waitrose newborn and mini size nappies are not only designed with specific embossed top sheets for full absorbency, but they also have overlapping tapes to ensure a flexible fit for even the smallest of waists. 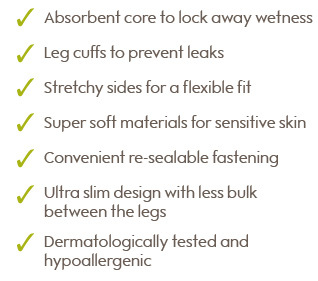 The newborn size has a specifically shaped, narrow core for added comfort between the legs, and an umbilical cut out with fewer materials over the umbilical area for added comfort and less irritation.